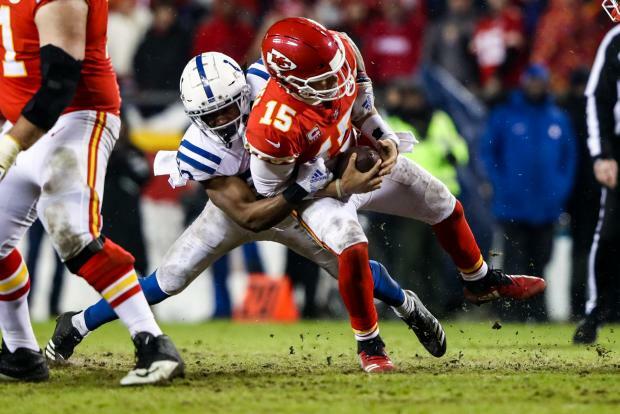 Patrick Mahomes #15 of the Kansas City Chiefs is hit by Kenny Moore #23 of the Indianapolis Colts. A record-setting rushing performance sparked the Los Angeles Rams over Dallas and into the NFL playoff semi-finals Saturday alongside with Kansas City Chiefs, whose defensive unit dominated in a lopsided victory over Indianapolis. C.J. Anderson ran 23 times for 123 yards and two touchdowns while Todd Gurley added 115 yards and a touchdown on 16 carries as the host Rams ripped the Cowboys 30-22 in a National Conference playoff game. "It was incredible what they did," Rams quarterback Jared Goff said of his blockers and rushers. "We know this defense and we prepared for it well. We ran the ball well. It started with Todd. C.J. added to it. We did it really well." The Rams will face either top seed New Orleans or defending champion Philadelphia next weekend in the conference final with a trip to Super Bowl 53 next month in Atlanta at stake. At Kansas City, Patrick Mahomes threw for 278 yards and ran for a touchdown while Damien Williams ran for 129 yards and a touchdown to lead the Chiefs over Indianapolis 31-13, snapping a 25-year NFL home playoff win drought that saw Kansas City lose six straight. "We played a great 'team' football game," Mahomes said. "The defense did amazing and the offense did enough to get the win in the end." The Chiefs will host next week's American Conference championship game against Sunday's winner between the Los Angeles Chargers and New England Patriots for a berth in the February 3 championship spectacle. "There's a lot of confidence, a lot of chemistry and a lot of guys playing their tails off for each other," Chiefs co-captain Travis Kelce said. The Rams ran 48 times for 273 yards, eclipsing their old post-season rushing mark from 1986 against Dallas by four yards, and inflicting the best rushing total of the campaign against the Cowboys. Anderson and Gurley were the first two Rams rushers to crack 100 yards in the same playoff game. Two crucial fourth-down plays by the Rams in the fourth quarter proved pivotal. LA stopped Dallas on downs to open the final period, then the Rams drove to the Cowboys goal-line, disdaining a point-blank field goal attempt to seek a touchdown, which Anderson obtained on a 1-yard run to give the Rams a 30-15 lead with 7:16 to play. Dak Prescott scored on a 1-yard touchdown run with 2:11 remaining to lift the Cowboys within the final margin but the Rams took the ball and ran out the clock for the victory. Zuerlein added a 23-yard field goal and the Rams regained the lead on Anderson's 1-yard touchdown run, then stretched it to 20-7 at half-time after Gurley's 35-yard touchdown scamper with 3:27 remaining in the second quarter. Zuerlein added a 44-yard field goal early in the third quarter but the Cowboys responded with a touchdown drive capped by Ezekiel Elliott's 1-yard touchdown run and a 2-point Prescott conversion pass to Cooper. After reaching their first conference final in a quarter-century, the Chiefs will try to return to the Super Bowl for the first time since 1970. "We've got two more to go," Mahomes said. "I'm happy we're playing the next one here in front of our home fans." Mahomes, who completed 27 of 41 passes, directed touchdown drives of 70 and 90 yards on Kansas City's first two possessions to seize command, Williams scoring on a 10-yard run and Tyreek Hill rushing 36 yards into the end zone, while the Colts, who won 10 of their prior 11 games, managed only 12 yards in the opening quarter. Harrison Butker added a 39-yard Chiefs field goal but the Colts scored when Najee Goode smothered a Dustin Colquitt punt -- his first block suffered in five years -- and Indy's Zach Pascal recovered the ball in the end zone. Kansas City responded with a touchdown drive capped by a 4-yard touchdown dive by Mahomes for a 24-7 Chiefs half-time edge. Mahomes, who passed for 5,097 yards and 50 touchdowns this season, threw for 195 yards in the first half, the most in a playoff debut since 2003. Luck connected with T.Y. Hilton on a 29-yard touchdown pass with 5:31 remaining but Adam Vinatieri was wide right on the conversion kick and the Chiefs created the final margin off a 6-yard Darrel Williams touchdown run. Patrick Mahomes threw for 278 yards and ran for a touchdown to lead the Kansas City Chiefs over Indianapolis 31-13 Saturday, snapping a 25-year NFL home playoff win drought. The victory took the top-seeded Chiefs into next week's American Conference championship game at Kansas City against Sunday's winner between the Los Angeles Chargers and New England Patriots. Luck connected with T.Y. Hilton on a 29-yard touchdown pass with 5:31 remaining but Vinatieri was wide right on the conversion kick and the Chiefs led 24-13. The Chiefs answered with a clinching touchdown drive, Darrel Williams scoring on a 6-yard run with 2:23 remaining to seal the Colts' fate.